The Schwinn R616 is the recumbent version of the company's U616 upright, and both are the best selling models in the lineup. They offer a lot of features and capabilities, especially given the low price tag, so they're a good pick for the home gym. The Nautilus R616 has a step-through design, a sleek modern look and narrow profile, all black with silver accents and a large, intuitive console with blue black-lit display. There's plenty to like about the Nautilus R616 recumbent bike, as it's got a lot of great features for under $600 when it's on sale. Both the R616 and its brother, the U616, have emerged as their most popular exercise bikes, bridging the gap between the entry level models and the top of the line bikes. With the R616, you get 29 workout programs, including heart rate, recovery, fitness test, profile and quick start. So there's plenty of workout variety to keep you motivated to work out more often. If you want to train without programming, there are 25 levels of resistance to choose from to make your workouts more challenging, 5 more than on the base R614 model. There are two ways to measure your heart rate...either with the hand grips or wirelessly if you have a chest strap. 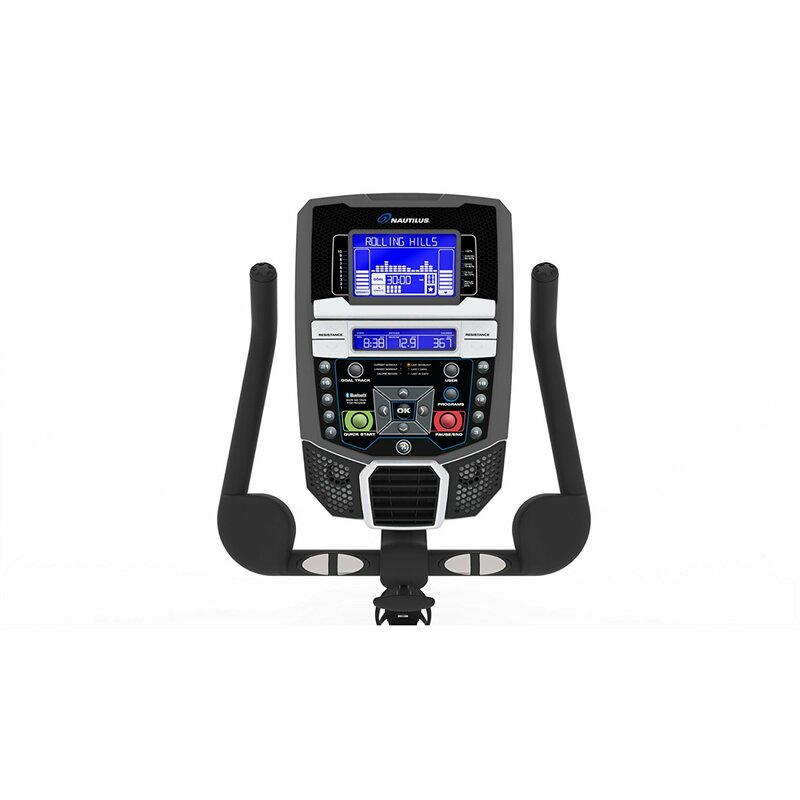 One of the most appealing features of the R616 recumbent is the built in Bluetooth capability, which allows you to link up with the Nautilus Trainer App and Run Social to track and share your workout results. This is a great feature, not found on the base model, that really helps keep you headed towards your fitness goals. There's plenty of extras as well...you get 4 user profiles, enhanced pedals and seat, water bottle holder, tablet holder, 3 speed fan, sound system with speakers and a USB charging port. 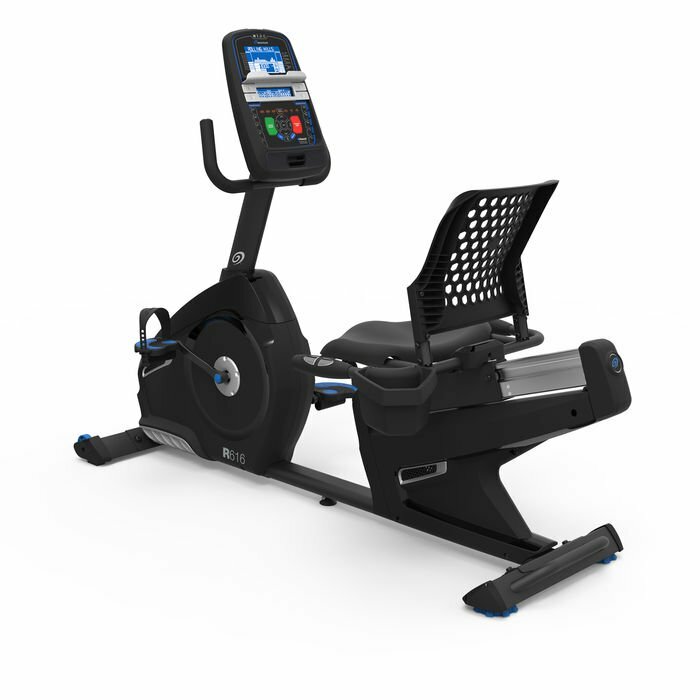 The Nautilus R616 recumbent bike comes with a 300 lb. max user weight capacity and a 10 year frame, 3 year parts, 1 year electronics and 90 day labor warranty. How Does the R616 Compare to the Other Recumbent Nautilus Exercise Bikes? As we mentioned above, the R616 is in the middle of the recumbent pack, so it has more features than the base R614 but not as many as the R618. Let's take a closer look at all three to see how they are alike and how they are different. This will help you make a more informed buying decision. The base R614 recumbent, just like the U614 upright, has 20 resistance levels, an 18 lb. flywheel, grip heart rate and 22 workout programs. You get 2 user profiles, a padded/vented seat and a 300 lb. max user weight capacity. The mid-level R616, as you read about above, comes with more of most of the main features. You get 25 resistance levels, a 22 lb. flywheel, grip and wireless heart rate and 29 workout programs to choose from. Here you get 4 user profiles, enhanced pedals, Bluetooth workout tracking and a longer parts warranty. The top of the line R618 isn't too much different than the R616, but it does have a heavier 30 lb. flywheel, free wireless chest strap, a reclining gel seat and premium pedals and handlebars. It also has a much stronger warranty than the R614 and R616. So as you can see the R616 recumbent is a big step up from the R614, but only a small step down from the top end R618. Overall the R616 fared quite well in our reviews. It's got a ton of great features including plenty of resistance levels, workout programs and tracking capability. The motion is very smooth and natural, and there are a lot of great comfort features from the padded seat to the 3-speed fan to the music entertainment. The R616 is our favorite of the three Nautilus exercise bikes, but if you want to save a little money consider the R614. It doesn't have Bluetooth or wireless heart rate, but it has plenty of other features to keep you satisfied. If you want something a little more durable, take a look at the up-level Nautilus R618.